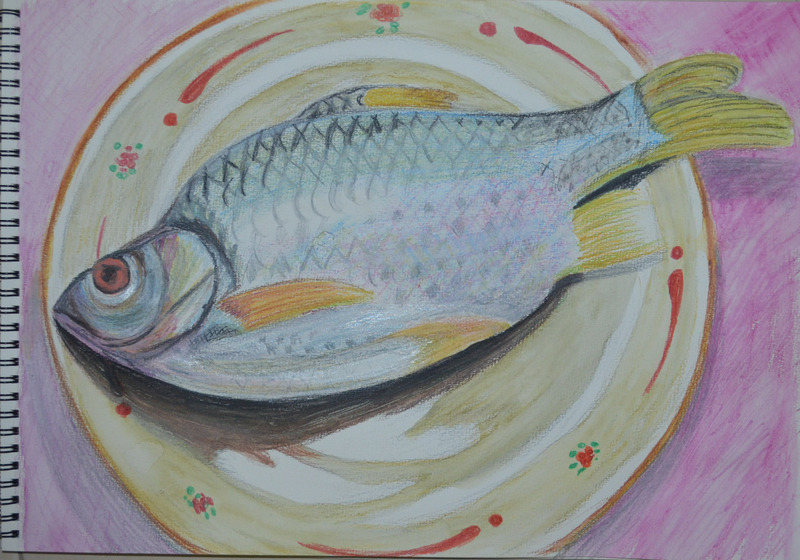 In this exercise I was to buy a fish and put it on a decorative plate, setting the plate in a neutral context. 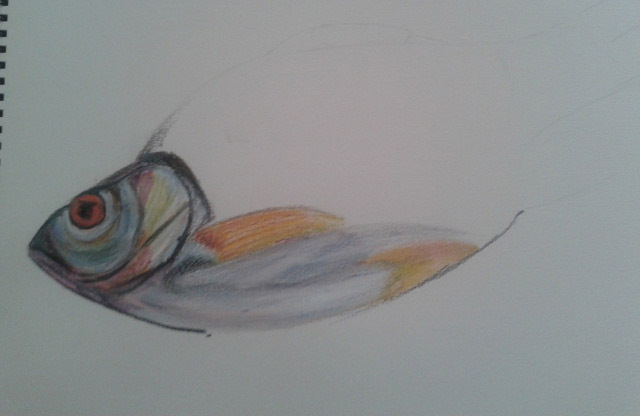 Ideally using water-soluble pencils to draw the fish, paying special attention to the , way the light catches the fish’s eye, mouth, gills, body and tail. 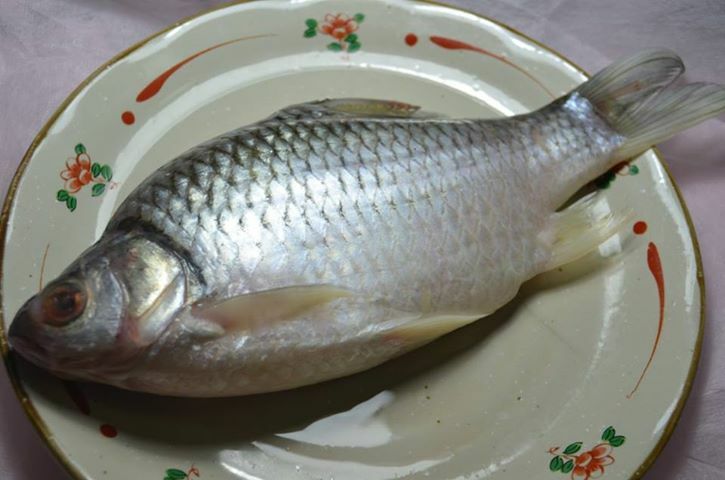 Well my first obstacle was to buy a fish as we have a totally different variety of fish here in Thailand than the UK so I chose a fish called a Pla Tha Pien which maybe a Java Barb or Gold Foil Barb. It wasn’t a very attractive fish but it did a really good job of catching light. I didn’t have a really nice plate either in fact I am a bit of a minimalist and only had one plate until last week so I used the same plate as I had used in other exercises. The next obstacle was the paper, I couldn’t find any Bockingford paper and the closest I could find to it was a Canson Cotton paper that was over 50 pounds for a pad and on my budget that just wasn’t happening, so I bought a cheaper Canson paper that stated ‘Wet and Wet Technique’ and ‘re-workable’ on the front, at only 420 Baht or 8 pounds for 20 I thought that was reasonable, slightly smaller than A3, A3 being the size of the really expensive next step up. I wasn’t very clear on the ‘water-soluble pencils’ it said in the brief for the exercise, I have a small pack of Derwent water-soluble sketching pencils, water-soluble colour pencils by Masterart and a pack of Watercolour pencils by Faber-Castell, so I used the latter. I tried wetting the paper first and it warped like hell and after an attempt at drawing on it I decided that it would be best to draw, go over it with the brush and then draw again while the paper was still wet, this technique worked. 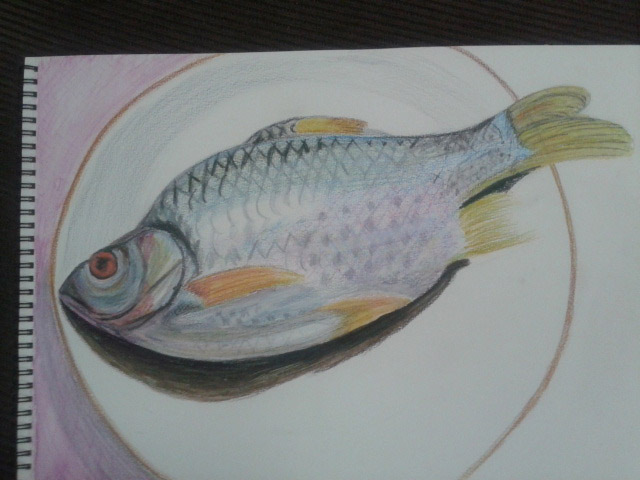 With a limited pallet of colours but not too limited and the way I positioned the bendy light over both fish and plate it was easy to see what colours I should use on the different parts of the fish, the only problem I could see was how I would go about drawing the texture of the scales on the fish’s body. The head was easy enough and didn’t take long to complete, I used 5 colours in total on the head drawing dry then going over with a wet brush to blend and then re-working where necessary and I am pretty pleased with the results on the head which I think looks very like my subject. From there I worked on the underneath of the gills and the belly and then up through the fins to its top side. On the side of the fish I used very similar colours as I did for the head but a very different drawing technique, I found that hatching in a light blue, light green and light pink over the top of each other created an almost scaly texture which I then went over with a wet brush and then filled in some of the diamonds with a dark grey. 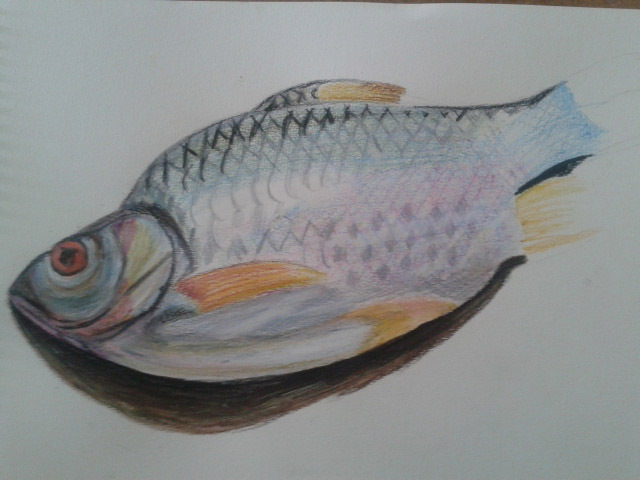 The most difficult bit of the fish was the top and the front of the dorsal fin as when water touches black it becomes a bit too dark especially for a drawing like this. 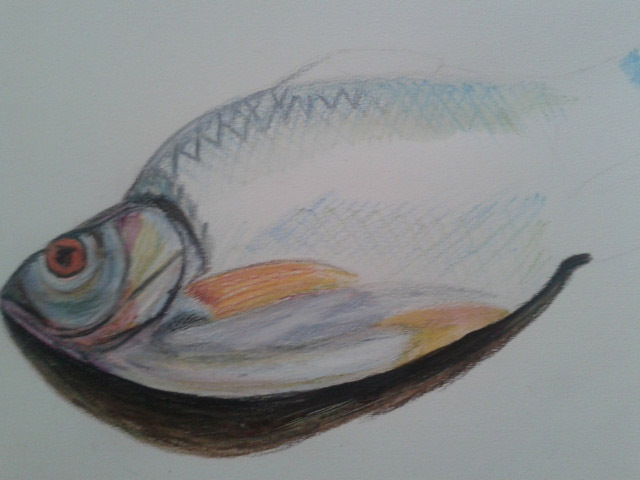 I have looked at several tutorials which say if you have to use black use a dark blue , which would not be suitable for this fish. In the end I did use black but over the top of an already damp paper and then went over it with a cotton bud to catch some of the colour. The finished drawing is not brilliant but for the time I spent on it I’m quite happy with the results. The only part of this picture I am not happy with is that I rushed the completion of the violet coloured cloth that I used for a background.